Teresa Stolz came from Kostelec nad Labem in Bohemia, then part of the Austrian Empire. She had two sisters who were identical twins, Francesca and Ludmila. She studied under Joseph Nerida and at the conservtory in Prague under Giovanni Battista. In 1851 she was expelled from the Conservatory and she continued her studies under Vojtech Caboun. She followed her brother to Trieste and there Luici Ricci was her teacher. She debuted in 1857 in Tiflis and appeared in many other cities before she went to Italy in 1864, where she studied under Frnacesco Lamperti in Milan. She appeared at the Scala from 1865 to 1877. On 27 Feb 1869 she was the first Leonora in Verdi's revised version of "La forza del destino" and she sang the title role at the European premiere of Aida on 8 February 1872 in Milan. She was also the soprano soloist in Verdi's "Requiem" on 22 May 1874 and she repeated that part in London, Vienna and Paris. The conductor and composer Angelo Mariani was her lover and her fiancee, but their relationship ended in 1871. It is unclear if she had an affair with Verdi around that time. After Verdi's wife Giuseppina Streppina died in 1897 she became his companion, but it is possible that their relationship was platonic. She died in 1902, one year after Verdi. 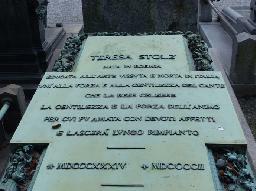 The grave of Teresa Stolz at the Cimitero Monumentale, Milano.